Swiss chandelier in brass, Switzerland, 1960s. This delicate chandelier is minimalist yet warm. The light consists of multiple light bulbs that are placed on the ends of brass horizontal beam. The beams form a cross-like pattern. The light source reflects on the brass resulting in a warm and bright light partition. 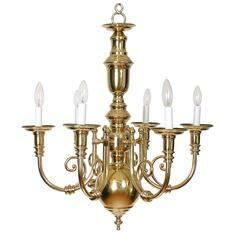 Six-light, 1960s retro American Colonial style chandelier.